Sister Clare Marita Pearce, O.S.F. 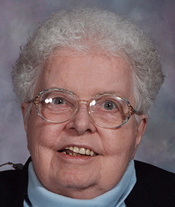 Sister Clare Marita Pearce, O.S.F., 88, died July 22 in Assisi House, Aston. She had been a professed member of the Sisters of St. Francis of Philadelphia for 66 years. Sister Clare Marita (Clare Elaine Pearce) was born in Philadelphia where she was a member of St. Columba Parish in North Philadelphia and a graduate of John W. Hallahan Catholic Girls’ High School. Prior to her entrance into the congregation, she worked as a file clerk at the civil service office of the U.S. Army, 3rd Service Command in Philadelphia. She entered the congregation in 1944 and professed her first vows in 1947. Sister Clare earned a B.S. in education from Mount St. Mary University in Emmitsburg, Md., and an M.A. in library science from Villanova University. She ministered in education on the elementary, secondary and college levels as both teacher and librarian. Sister Clare Marita’s 46 years of service in the Archdiocese of Philadelphia included working at St. Hubert’s High School (1965-1969, 1985-1998); Neumann University (1969-1972); Our Lady of Consolation School (1973-1975); Malvern Preparatory School, Malvern (1975-1981); and Cardinal Dougherty High School (1981-1985). From 1998-2001 she volunteered at St. Maria Goretti High School in Philadelphia. In 2002 she moved to Assisi House where she served in prayer ministry until her death. Sister Clare Marita ministered in the Diocese of Wilmington for nine years and in the Archdiocese of Baltimore for nine years. Additional ministry experience included teaching at Catholic schools in Whitehall and York, Pa.
All services will be held Tuesday, July 30 in Our Lady of Angels Convent Chapel, 609 S. Convent Road, Aston. The wake will be held at 10:30 a.m. followed by the viewing, with the funeral Mass following at 12 noon. Burial will be in Our Lady of Angels Cemetery in Aston. Sister Clare Marita is survived by her sister, Nancy Williams, nieces, nephews, and by her Franciscan family. Donations in her name can be made to the Sisters of St. Francis Foundation, 609 S. Convent Road, Aston, PA 19014.